There’s nothing quite like the gift of flowers. Whether they be fresh or made from paper, they bring instant cheer. The tulip imagery and thoughtful phrases in the You Deserve Flowers stamp set offer the chance to take your flower-giving to the next level. Mix and match tulip blooms, stems, and leaves to create small accents for tags or multi-colored backgrounds for cards. With a focus on kindness, cheer, and praising another’s self-worth, the sentiments in the set can be used for any occasion, not just giving flowers. STAMP DETAILS: This set comes divided between two 4×6 acetate sheets. The “kindness blooms” sentiment measures just under 1 ¾” wide and just under 1 ¼” high. The “cheers” sentiment measures just under 2 ½” wide and around 1 ¼” high. The “these are for you” sentiment is just under 1 1/3” wide and about 1 ¼” high. The larger solid tulip bloom is ¼” wide by 1/3” high, and the 3-stem bouquet measures approximately 1/3” wide and just under 1” high. These oversized sentiment dies coordinate with the “You Deserve Flowers” stamp set. “Flowers” has a corresponding stamp in the set, perfect for stamping or coloring with watercolors or markers. While “hello” and “for you” do not have matching stamps, they share the same fonts and themes as some of the stamps in the set, and are large enough to create quick and simple tags or cards with minimal supplies. DIE DETAILS: Contains a total of 3 dies. Are you looking for a fun shape to break the mold of tag-making? 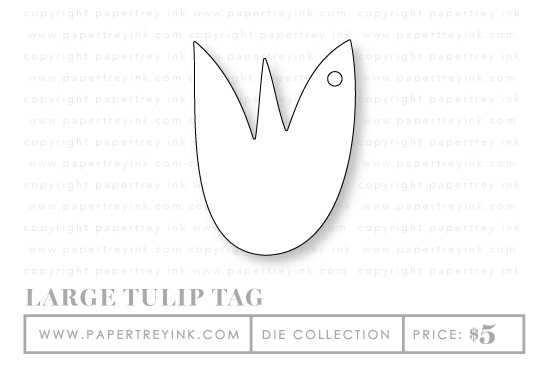 This cute Large Tulip Tag die is just what you need! Use it as a gift tag with a bouquet or vase of flowers, tie it onto a spring or Easter present, or use it as an accent on a greeting card. It coordinates with the “You Deserve Flowers” stamp set, with many of the sentiments and all of the floral images fitting its surface. Here is another essential tag set from Paper & Package. 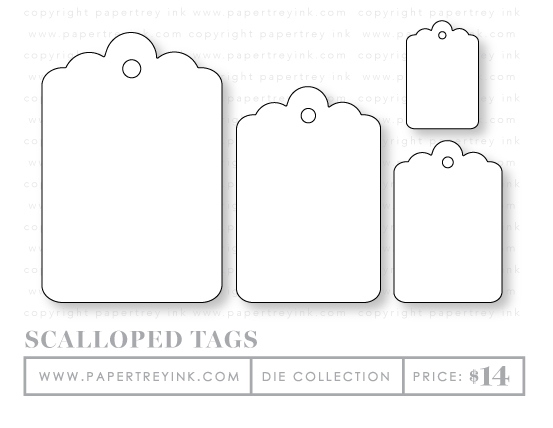 The You Deserve Flowers Scalloped Tag die collection offers 4 different sized tags to cover all of your creative needs. Layer them together or use them separately on projects large and small. These dies are also sized to coordinate with the “You Deserve Flowers” stamp set. DIE DETAILS: Contains a total of 4 dies. As the weather warms and the earth comes alive after a long winter, little pops of green dot the landscape. Snowdrops, Lily of the Valley, and unfurling ferns are some of the first harbingers of spring. 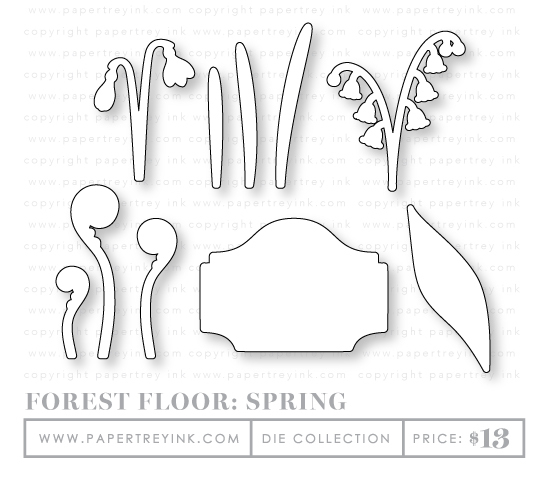 Forest Floor: Spring eagerly embraces their arrival! This set includes flowering botanicals, a charming frame, and a handful of sentiments ideal for springtime occasions and beyond. Pair these images with the coordinating dies to create projects with dimension and style. STAMP DETAILS: This stamp set comes on one 4 x 6 acetate sheet. The “Happy” sentiment measures 1 ½” wide by just over ½” tall. The assembled lily of the valley image (stem and blooms) measures just under 1 ⅞” wide by 2 ⅛” tall. The assembled snowdrop image (stem and blooms) measures 1 ⅓” wide by 1 ⅞” tall. The smallest fern front measures ⅜” wide by 1 ⅕” tall. The frame images measures 2 ½” wide by 1 ¾” tall. The “birthday” sentiment measures ⅘” wide by just under ⅛” tall. DIE DETAILS: Contains a total of 10 dies.